Moving and using my compost mountain followed by watching the sunset and the birds. Magic! A wet day on the plot and how to buy your compost in bulk for about a tenth of the price of buying bags in the garden centre. Get your compost here! 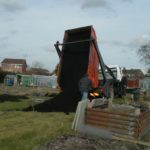 7 tonne lots of compost start arriving but the lorry gets stuck, which made for an interesting afternoon to say the least. Our NVS meeting, what happened to a week and the urge to move to the sun is striking us as I'm working on some property abroad sites. Wonderful weather everywhere but here from what I gather. Sowing onions and cauliflowers. A few more spuds, some serious digging and an absolutely fascinating email from Canada.